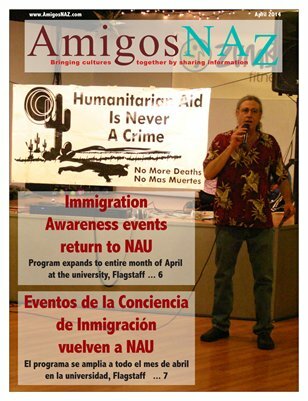 The April 2014 edition of AmigosNAZ opens with a cover story on "Immigration Awareness Month," a series of lectures, film screenings and other programs to be held in April at Northern Arizona University (NAU) and elsewhere in Flagstaff. The edition also includes a commentary on a 'National Day of Action' rally against deportations on April 5 in Flagstaff; news briefs on the NAU researchers reporting on the impact on deforestation in Central America by drug traffickers; upcoming free tax assistance events in Flagstaff; a teen job fair on April 10 at Coconino Community College; a small business health fair on April 11 in Flagstaff; a stroke support group on April 17 at Flagstaff Medical Center; a commentary by the Coconino County Public Health Services District on doing your homework before getting that tattoo and a listing of upcoming events in the region. All this and more brought to you by AmigosNAZ — Providing information for and about the vibrant Latino community in Northern Arizona.